A good salesman always sounds convincing, even if underlying facts change the spiel, and New Jersey Nets CEO Brett Yormark is at the top of the game. In three radio or TV interviews over less than 15 months, Yormark offered unwavering predictions about the opening date of the Atlantic Yards arena (aka Barclays Center) in Brooklyn. First, he said 2009, then 2010, then 2011. Just take a listen to this one-minute audio file embedded below. I’ve interpolated my own questions into the remix, but the original quotes come from the interviews transcribed below. Why does Yormark radiate such confidence? I suspect the goal is to attract additional sponsors and buyers of suites. If the arena seems like a mirage, it'll be harder for them to sign on the bottom line. Yormark sometimes qualifies his certainty, but mostly he doesn’t; he just moves on and offers a new prediction. Maybe that’s a habit developed in SportsWorld, where interviewers are often fawning or unprepared. By contrast, the Empire State Development Corporation and Forest City Ratner more frequently use words like “expected” or “anticipate,” prudently leaving wiggle room in case the announced schedule won’t be met. Bonus: at right is an excerpt from press materials distributed 12/10/03, in which Forest City Ratner suggested completion of the arena was "set for the summer of 2006." In a 9/12/07 interview on WFAN radio, Yormark mentioned the move four times; two times he hedged slightly and the other two times he expressed certainty. He was asked: What have your challenges been, marketing this New Jersey team? Because New York has always traditionally been a Knicks town. What have you overcome to get the name out there, particularly with this move to Brooklyn? BY: Well, it has been challenging. When you think about what the next couple of years has in store for us: we’re leaving New Jersey, we’ve been very honest about it, and we’ll be in Brooklyn for the '09-'10 season. And our goal is not to alienate our core fan base in New Jersey, but at the same time encourage people from the other side of the river to start to test drive us, to sample us." A little later a caller suggested that the move was more likely three years away, not two. Yormark hedged slightly. BY: There's a lot of activity on the site right now, we're doing a lot of demolition. We're relocating the railyards. We've just ordered steel and we're expecting, hopefully, to break ground, in October-November. It usually takes about 24 months to build an arena that's 850,000 square feet, so we think we're going to be right there for the '09-'10 season, and very excited about it. A little later, however, he returned to certainty. BY: And when you think of Brooklyn, if it wasn't a borough it would be the fourth largest city in the U.S., it's been underserved in the area of sports entertainment for years, and we will be there for the '09-'10 season, and it's going to be one of those great moments in sports. A bit later, he hedged once again. BY: We’re extremely excited, as you know, about our move to Brooklyn, but we do have at least two years in Jersey, and while we’re in Jersey, we’re going to provide a great, great experience, a great product. As I pointed out that the time, even Forest City Enterprises executives, speaking a day earlier, didn’t think lawsuits would be cleared until the middle of 2008. Anything other than a faux groundbreaking couldn’t begin until then. Thus, the process Yormark said would take 24 months wouldn't have begun until 2008, which moved the arena in 2010, not 2009. Actually, Bruce Ratner has said it would take 30 months and the ESDC’s construction schedule suggests 32 months. Though it's possible that, in the absence of other major construction project, construction could be accelerated, until such a speed-up is announced, we shouldn't accept a 24-month estimate. Yormark, in a 12/12/08 Star-Ledger profile, improbably suggested that, if not for me, he wouldn’t have taken the job with the Nets: “And he's the guy responsible for me having this job -- totally sold me on Brooklyn, totally sold me on the Ratner project." Let’s go to the audiotape. He told WFAN in the above interview: This is a job that I had my eyes on for quite some time. I started my career in 1988 with the Nets selling tickets. And my dream was always to come back and to lead the franchise. “We plan on... being there for the '10-'11 season"
In a 7/30/08 Fox Business Channel interview focusing on sponsorship interviews, Yormark was given the opportunity to pitch the Nets. His answer: Things are going really well for us. In May, we opened up the Barclays Center showroom, in the New York Times Building. And we are selling our suites, and doing quite well. What we’re finding is that big companies, and brands, are investing, for the long haul, and we’re hoping that that investment will be part of the Barclays Center. With respect to our other advertisers that we’re talking to, with respect to being involved with the Barclays Center, that’s going well, also. We recently announced seven of our 14 founding partners. A couple more are on the way. So we’re very excited about the interest. We plan on breaking ground in November and being there for the '10-'11 season. As I pointed out at the time, Bruce Ratner had told shareholders a month earlier that construction would start in January 2009 and take two-and-a-half years--a timetable far different from the developer's public statements. So Yormark, whose phrase “plan on breaking ground” offered a bit of a hedge, certainly knew better. After all, an expected eminent domain suit had not yet been filed in state court--it was filed a few days later--and there was no reason to think it would be resolved by November. But that admission might have deterred some additional "founding partners." 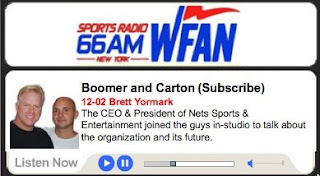 On 12/2/08, after Forest City Ratner had stalled all work at the MTA’s Vanderbilt Yard--but before that was widely known--WFAN host Craig Carton pressed Yormark (audio) and the CEO finally responded with an ironclad prediction. CC: So let's get down to the bottom line here. You're not moving to Brooklyn. BY: We are moving to Brooklyn. CC: You're not moving to Brooklyn. BY: We're moving to Brooklyn. CC: Why can't you guys come clean and just be honest? CC: How are you going to move to Brooklyn? [Chuckles] They haven't put a shovel in the ground yet. BY: A realistic time frame is in Brooklyn, operating in the summer of 2011, being there for the '11-'12 season. CC: --you think that you’ll have everything built, the infrastructure done, and you will bounce a basketball in an arena in Brooklyn in three years? BY: Absolutely. Convinced of it. 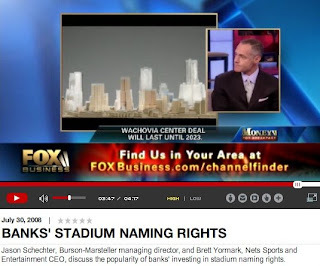 Co-host Boomer Esiason then moved on to another topic, the Barclays naming rights recommitment, and Yormark said that nine founding partners had signed on. Then Carton returned to the timetable. CC: There's got to be a drop-dead date. You can't keep Net fans and the borough of Brooklyn out there waiting and waiting and waiting.... Ballpark, what's the date on that? CC: If you don't put a shovel by next New Year's Eve, then you might come back and say 'You know what, we're not going to Brooklyn'? BY: I wouldn't say that but I would say 2009 is the year. I say that for lots of different reasons. We've got really one piece of major litigation that remains... the eminent domain case. There will be a hearing in January, hopefully a favorable decision by the end of March... We just had a favorable ruling with the IRS, to use tax-exempt financing for the building. And Barclays, obviously, has reaffirmed their position. So I feel that 2009 is our year. So, while Yormark is absolutely convinced that an arena will open in 2011, he's leaving open the option for construction to begin after 2009--meaning an opening date no earlier than 2012. Yormark may have convinced himself, but his best-case timetable is very unlikely. Not only must current and future lawsuits have to be cleared by mid-April for groundbreaking to meet Bruce Ratner’s 30-month timetable, but also the credit markets have to recover. If the timetable is, in fact, 32 months, the lawsuits would have to be dismissed by mid-February. And that's assuming nothing else goes wrong. Given the shifting predictions--remember that 2006 opening date?--caution, rather than confidence, seems more prudent. 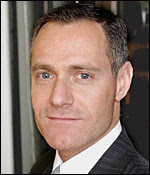 When will Yormark start offering 2012 as a best-case scenario? Privately, I suspect, he’s already doing so. Publicly, however, he’ll first have to face some interviewers armed with inconvenient facts.